Read all instructions before using your Built-in Vacuum Cleaning System. • Disconnect power units electrical plug before servicing. • Do not use outdoors or on wet surfaces. • Do not allow to be used as a toy. Close attention is necessary when used by or near children. • Use only as described in this manual. Use only manufacturer’s recommended attachments. • Do not handle hose, outlets, or unit with wet hands. • Keep hair, loose clothing, fingers, and all parts of the body away from the openings and moving parts. • Do not pick up anything that is burning or smoking, such as cigarettes, matches, or hot ashes. • Do not use without dust bag and/or filters in place, if required by the power unit. • Use extra care when cleaning on stairs. • Do not use to pick up flammable or combustible liquids such as gasoline or use in areas where they may be present. • Do not store flammable or combustible product within three (3) feet of the power unit. 1. Open the door and pull out the amount of hose you need. You will feel the hose stop when you get to the end. If the hose comes completely out of the wall, simply reinsert the hose several inches back into the inlet. 2. Place the locking mechanism into the locked position. Note: The locking mechanism prevents the hose from retracting while you vacuum. If you wish to pull out more hose, turn off your vacuum before moving from the locked position. Option 1 - Use the low voltage switch at the inlet. Option 2 - Use the RF handle. Hold the switch in the “on” position until you hear the vacuum, and/or air flow. Then let go of the switch. Attach appropriate tools and begin vacuuming. 1. With the vacuum still running and all attachments disconnected, bring all of the hose back to the base of the inlet. 2. Move the locking mechanism to the unlocked position. 3. Regulate the retraction speed carefully by placing your fingers or the palm of your hand over the end of the hose. Control the speed until the hose has retracted itself completely into the inlet. 4. Turn the system off after the hose is returned completely into the inlet. If you turn the unit on with the RF handle (A), you must turn the unit off with the RF handle. If you turn the unit on with the low voltage switch (B), you must turn the unit off with the low voltage switch. 5. Be sure the locking mechanism is in the unlocked position (the door will not close properly if it is locked). Close the door. 1. Open the battery casement. 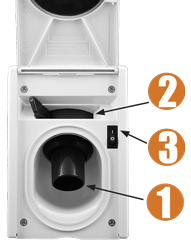 Locate the battery casement just below the metallic nozzle at the front of the RF handle (the lid of the battery casement can be identified by a white outlined battery icon). Insert a small flat head screwdriver into the slot at the base of the battery casement lid and gently pry upward. 2. Pull out the battery casement. Once the battery lid has been raised, using thumb and index finger, pull the casement straight up until batteries are visible. The unit requires two CR2032 3V lithium batteries. 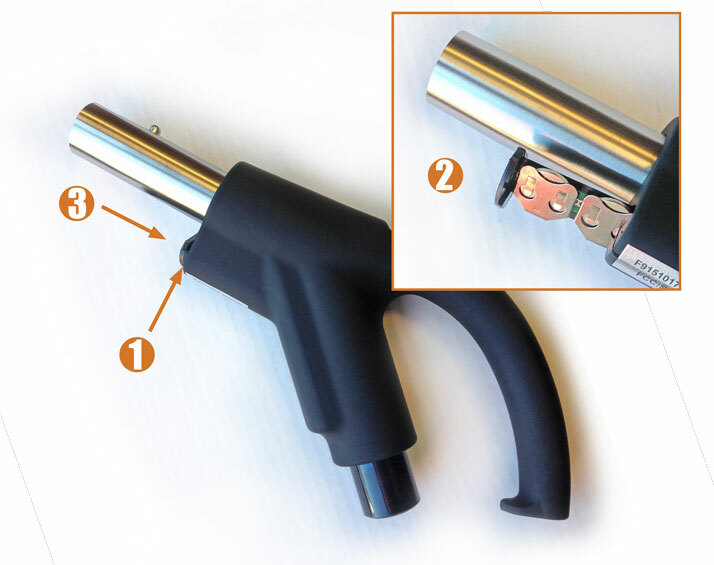 Using thumb, carefully push the battery casement back into the handle until it clicks. When you replace the battery, you may have to reprogram the handle. RF Handle is optional. A standard handle, without RF, is also available. The unit requires two CR2032 3V lithium batteries. 1. Depress the recessed button on top of the receiver with a ballpoint pen. The green light will come on. 2. While the green light is on, push the handle switch to the ON position. If the power unit does not turn on, turn the handle OFF, then ON. WARNING: If the button on the receiver box is depressed until the green light starts to blink, all programs have been erased. Re-program handle(s). If the motor still will not turn on, the receiver may need to be replaced. 1. Check main home breaker panel to ensure the Vacuum Power Unit breaker is on. 2. Check Power Unit Reset Button. 3. Check the Power Unit plug with another electrical component to ensure it is operating properly. 4. Check that the Power Unit is plugged in. 5. Check all connections between the RF Receiver, RF Power Supply, and the Power Unit. Press the handle switch to the ON position and check to see if the LED light on the handle turns on steady green. If the LED light does not turn on, the batteries need to be changed. If the LED light blinks green, then red, the handle needs to be re-programmed. 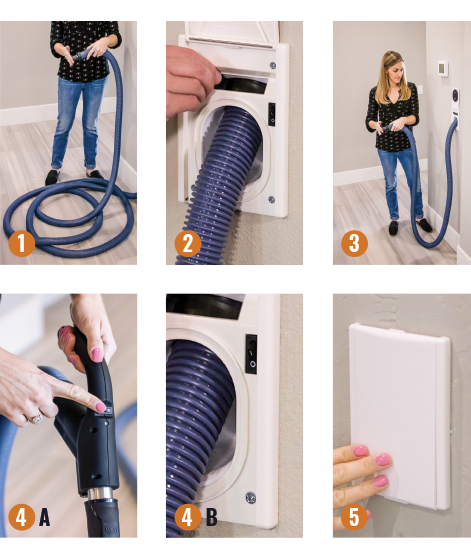 If the hose comes completely out of the wall, simply reinsert the hose several inches back into the inlet, turn the power unit on and retract normally. In some instances, the hose has been known to push the valve door open and fall out on its own. If this occurs, contact your dealer. Who do I contact for system service and repair? It is best to contact the dealer who sold you your system. Most dealers have Hide-A-Hose authorized technicians who can come to your home, diagnose your system, and repair the problem. Who do I contact to order accessories? Your dealer is the best resource for choosing and ordering the right accessories for your system. How do I contact Hide-A-Hose? While Hide-A-Hose stands behind everything we make, your local factory-authorized dealer should be able to assist you with any problem you might have with your system. If you do need to contact Hide-A-Hose directly, use the contact information listed below.